1920 - the Bombay Catholic Urban Co-operative Credit Society was formed with a mission to cater to the community's financial needs. From 1920 to 1984, the journey was long and arduous. But, the transition to a Bank was a dream come true. Through this journey of almost a century, the dove has remained an inspiring symbol of the peace and prosperity we have spread. However, it is time to soar high. 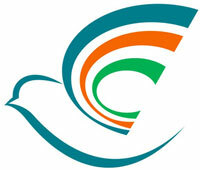 The new dove logo has been created from the initials of our bank CCC, which form its wings. It also signifies our focus viz. Capital, Character, Credit. The body of the dove resembles a palm reaching out in service. The colour blue represents the profits that we deliver to our stakeholders. Saffron and green the colours of our national flag, represent vitality and prosperity. The sky is the limit for our new dove in free flight. Change is the only constant. We have harnessed the latest technologies to upgrade our services. As we surge ahead with our new corporate identity, our commitment to prosperity for all, endures.